Joint Budget Planning - Help?! Earlier in the week, I wrote about the enlightening conversation that Jordan and I had about how we are managing our money. We've taken a stab at coming up with a realistic joint budget. We've decided that we'll work on an ideal budget (ie. 10% of income to RRSPs) once my student loan is paid off and we are no longer using our credit cards. The idea behind the joint budget, is utilizing our joint chequing account for more than just bills. We want to streamline everything that is coming in and coming out. We want to eliminate any uncessary stressors. First we listed our net income after taxes and deductions. We are planning to have both our pay cheques deposited into the same joint account. Next we listed all of our non-negotiables. Although sometimes the amounts will vary (ie. utilities and horse board in the winter). These are expenses that are going to be there no matter what. This plan includes my our debt repayment plan of having the student loan paid off by December. Next we listed all of our variable expenses. Each column that is highlighed in yellow would have it's own ING (or other) account. Every other cent would live in the joint account. The Planning Spending money is key here. We would like to get a joint credit card and this sum of money would be earmarked to pay it off each month. We figure that this will be the best way to streamline joint expenses and track exactly what we're spending at the same time. We would also buy our groceries, gas and anything else that was joint with this credit card. That way, we'd know exactly what we were spending. The c/c limit would be set based on what all those expenses add up to be each month. With this plan we've set our allowances at $400/month and there is still about $200 left over. What to the allowances cover? After we look at what we would be personally responsible for, Jordan would have about $200 left over and I would have about $250-$300. I'm not sure that it's enough money to have some left over to save for gifts we may want to purchase for each other (ie. Christmas, Birthdays, etc.). Do you think it is? The idea behind this post is that it's a place to start. Nothing is set in stone just yet. We'd really like your opinions/help to refine this budget. It's important that we both feel like we are no longer strangled by limitations but freed with a solid plan. It needs to be easy/simple. So, please, feel free to offer suggestions or ask questions. We would both really love the help. Moving forward from my post last night about Jordan and I merging our finances together, I thought this blog was due for a re-vamp. When Jordan and I were out and about the other day - we found an amazing pair of shoes (in addition to the riding boots I told you about last week). Asolo is apparently an excellent, high quality brand of shoe. they are very comfortable and will be perfect for camping and light hiking. The support is good, so I shouldn't role my ankles. You can see that the shoes were regularly priced $200 and I bought them for $120 - that's an $80 savings or 40%. Yes, these are still expensive - but I'm tired of $20 walmart shoes that hurt my feet and don't last longer then a couple of months. These baby's should last me a long while and keep me comfortable! Jordan and I had an amazing conversation tonight (about money). He consistently feels like he doesn't have any money and is most often $20-$50 in his overdraft (which has a $100 max). This is a bit of a cycle, because each pay day he starts with a little bit less. Although it doesn't have the same interest ramifications - I compare this to the cycle some folks get into with pay day loans. He feels like money is going in to all these different places but doesn't have a handle about where/what that money is going/doing and is rarely sure about how much he has left to spend (hence the OD). I have been trending to use my visa more often then I should. I generally can pay it off - but sometimes it takes me a pay period or two. With so much money going to debt repayment, I fear that I won't have enough money to reach my goals - I struggle with easy/stress free management of my money. I over (or perhaps under) think money needs/wants which leads me to be in a place mentally that I don't like. We are both tired of trying to figure out who's money is doing which job and if it's doing enough of that job. We're tired of 'owing' each other. We see ourselves as a unit and a partnership and while not married - are legally common law. We feel like our money is not being managed in the way we are trying to manage our life and this leads to a disparity. Jordan said to me tonight "We've inherited each other." He went on to explain that he wants to walk-the-walk in terms of taking on each other and our debt/savings obligations together. I agreed, 100%. We talked about our fears. He asked if I was happy to do all the math and figure all the money out and I was able to really think about that question. I am happy to do the day-to-day tracking of money and come up with excel spreadsheets that do all the math for us, but not unless Jordan is a part of the process in coming up with our goals and plans for managing money. I can execute if he'll help develop. I want us both to be a part of the planning. I don't want either of us to have the opportunity to resent the other. Jordan said he trusts me. I listed to his needs. We're ready to take the next few steps in organising our life and our plans. We want to work together to come up with a plan and a budget that works. We want to have the same savings goals. We want to have one joint account where all the money lands, and our own personal chequing accounts for our 'allowances'. Jordan wants to know that the money his account is for spending and has no other job. I want to know that our future plans are taken care of. Jordan wants to know that we have money set aside for random trips to visit my family in BC. I want to know that Christmas is paid for. We're going to take care off all of those things and more, together. I'm so looking forward to sharing this journey with you all. Back in the beginning of May, Girl Makes Cents mentioned offhandedly that Proctor and Gamble had a brand sampler package available. All you had to do was sign up on their web page, and you could get a whole bunch of free samples!! Well, I had some free time so I clicked the link and signed up - I then promptly forgot about it. When I walked in the house on Friday, my roommate handed me a package. He asks me to open it and exclaims that he tried to sign up and get one too but they weren't offering them anymore (there was a website on the outside of the package). It was my P&G free sampler package. I'm really looking forward to trying out these items and will be sure to tell you if I've been converted to any of these products! so what changed, and where's my question? My horse board up until this point has been $165/month. During the first week of July my boarder stopped feeding hay and Starlight is now on full pasture. He has kindly pro-rated what I over paid for July and thus I only owe $27.50 for the month of July. What do you think I should do with the left over $275 this month? I'm inclined to just make an extra student loan payment, but if you look at any of my 'funds' on the side bars ------>>>> Do you think I should put the money in any of them? I'm sure most folks who read Jessie's Money, know that Jordan and I have gone through about a year of ups and downs when it comes to roommates. That said, it's that time again.....we've found a new fourth roommate. This one is a bit unique. We met Roommate X's parents last night. They are moving to another city, and their son (Roommate X), wants to finish his grade 12 year in this city. We gave the tour of the place and chatted for a few minutes about rent/utilties and lightly on our lifestyle (not a party house) and they told us about their son. He is currently going to the same highschool that Jordan went to and they both took (are taking) similar courses in school - plus Jordan used to play football - the same position that Roommate X currently plays. It's sort of earily weird. The parents will be paying rent/utilities. He goes to school and works 20-30 hours/week - plus he plays football. His parents said he's not around a whole lot. They seemed like absolutly steller people! I think this is going to work out well. Rent is the same as it always is $500/month plus 1/4 utilties and $500 DD. Our rent is $1,350 - so with our other roommate that leavges $350 for Jordan and I to pay plus 2/4 of the utilities and maintaining the household (we buy garbage bags, cleaning products and maintain the outside of the house for the most part). It's everybody's job to maintain the cleanliness of the inside of the house. This is going to give Jordan and I the opportunity to get our emergency fund back up to a healthly $1,000 in no time. Seeing as how Roommate X will be with us until the end of the school year (so...i think 10 months - until next June). We're looking at about $5,000 to perhaps get a few other 'funds' funded (have to talk to Jordan about that first). Jordan got a fantastic letter in the mail yesterday. As part of his apprenticeship he'll be receiving a $1,000 grant to be deposited within the next ten days. He had applied and we've been hoping for it for the last few weeks, but getting the confirmation letter sealed the deal! He'll also be eligible to apply for another $1,000 grant when he completes his second year and a final $2,000 grant for completing his third year and the program. Currently, he's planning on giving me $500 to replenish my emergency fund. We had depleted this when we had truck problems last month. He had also wanted to buy me some winter boots - and the rest? I'm not too sure. Both of our birthday's are next month so he may be saving some for that. I know that he's also looking forward to just having a bit of fun/play money for a while. Hurray to Government grants. Thanks! I've been on the hunt from some new ropers that are functional riding boots. 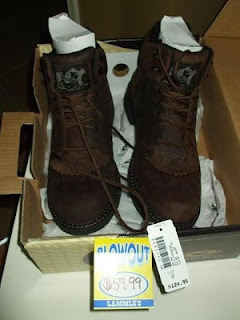 I also wanted boots that I could wear doing other activities (light hiking, camping etc). There are so many 'cowboy' stores in my city - but so many are just for looks. With stampede coming the fake cowboy fever is hitting this city with full force - so it's been a bit of a challenge. Can you see those tags! I saved $65 or 52% of the original price! There isn't a whole lot going on this early in the week. I've entertained a few e-mails about my car, but so far no one has come to see it. We've also shown the room to two people - both who were interested, but so far no one has put a deposit down. I spent the weekend gardening. It's been raining off and on for two weeks and we actually had some sun on Saturday/Sunday. It felt great to get my hands in the dirt. Strangely enough - we actually have some carrots growing (and we didn't plant any). We still haven't planted potatoes but I think the fear of frost in my neck of the woods is finally over - so I hope to do that next weekend. Hope your weeks are going well! I am a little late in the game, but I wanted to share what my network is sitting at. I'm pleased that I've finally broken through the $10,000 threshold! Actual value of the shares I have -is in the shares category. Payroll deductions which will be used to buy shares is in 'other assets' - so I can keep it separate from cash. Here's my budget for the next couple of weeks. I've increased my travel amount slightly because now that the snow is off the ground, we're bound to be out and about more often. I've also managed to squeeze an additional $200 student loan payment. This pay, I'm putting 33.66% of my income to debt. Not too shabby. After the payments clear, it will bring my Alberta Student Loan down to $3,985.85. Bills, do they every take a month off? Total is $235.46 - total for each of the four of us is $58.87. Why so super cheap? Do you remember a while back I told you that enmax over charged us for electricity usage? Well, we caught up to ourselves this month and that portion of the bill was only about $2. Now that the bills are in, it's time to settle up with our roommate who recently left. Unfortunately, we didn't sell the car or rent out the room. We've gotten a few bites, but haven't been able to real them in. It did feel like a really busy weekend though. On Saturday we drove a few hours to the Hot Springs and hung out in a tourist spot with some friends for the day. It was rainy in the morning which made it perfect spring Hot Springs weather. Sunday we spent some time with my best friend and her family. She's gone travelling for two months to Indonesia and it was her going away party. I helped her set up a travel blog, so hopefully that goes well. He started working at the company he works for almost a full two years ago, and yesterday he had his first performance and salary review. Thankfully, he had recently completed his first year apprenticeship and passed with flying colours - which resulted in an awesome review. His salary went from $38,400 to $42,000! His manager had first offered $40,800 and after a conversation about expectations and the work that Jordan has done on top of the money he's saved his company - he negotiated up to $42,000 which was exactly what he wanted! What does that mean? It's. So, all of those numbers are before tax - I want to know what the raise will actually net him. After a little spreadsheet math, and using the CRA's payroll deduction calculator. I estimate that Jordan will have an extra $100 every pay day. What he does with the extra money - is totally up to him. I have (of course) made a few suggestions. There's two things, one I'd love to see him do. One: Increase his RRSP contributions from $25/pay day to $50/pay. Two: I'd love for him to have an emergency/travel/planned spending whatever fund. Just a spot to put money - for him - for later. Here it is folks, the first of Jordan's bi-weekly budgets that has no truck payment!! For the next couple of weeks he'll likely have Visa payments of $150-$200 to have that cleared off - and then he's set. We're both looking forward to having a bit more flexibility week-to-week. I woke up this morning and thought, for a moment, that it was Monday - and I was a little sad. That was probably because we helped move a friend yesterday - and I'm tuckered out! He's moving in with his girlfriend (who happens to live in our neighborhood). It's pretty great to have a couple of friends close by. It did have me reflecting when Jordan moved in a few years ago - it seems like forever now. I've gotten a few responses from our roommate add - though nothing for the car yet. I think I'm going to have to pay a bit more for the add to have it appear on the first page. It costs about $25 - so I'm not sure if it's worth it just yet. One of my dearest friends is moving from BC to Alberta - and she got into town last night. I'm so happy. In a couple of months she'll have settled in and we'll be having all sorts of fun this summer (Hurrah!). She is a champion though - to minimize costs she has been sending boxes of things with friends who happen to be making the same drive, sending things on the greyhound (that are light in weight) and of course - making the driver herself. Time to get to work - have a great day!